In the mid-1940’S, Back Valley was a dirt road traveled more by horses, wagons and tractors than automobiles. In 1945 Perry Byrd brought his new bride, Dortha Jane (Dot) Owens, to his mother’s house in Back Valley. Dot brought with her an abiding love of reading and a great reverence for books. Books and printed materials were in short supply, and were loaned and circulated throughout the community. They were always cared for and returned to the owners as soon as possible. A Coalfield teacher, May McGlothin, who lived in Back Valley, found a way to get books at the Morgan County Courthouse. These were donated books; some were not in very good condition, but since there weren’t enough books at Coalfield School, she gathered as many as possible. Readers who can remember the 40’s know how scarce books were at that time. The growing collection was housed in various community members’ homes, and in late 1955, Dot Byrd took the books into her house. The Byrd family was trying to build a new house, a piece at a time and construction materials were always lying around the yard. Miss Dot tried to get someone else to take the books; however, most people were too busy. May McGlothin was teaching five days a week and going to college, as well as attending church every time the doors were open, as were many others in the community. In June of 1956, a truckload of lumber arrived at the Byrd’s and the driver wanted to unload. He didn’t know who had sent it except it had something to do with a library. After a little checking, Miss Dot learned that May McGlothin had bought the lumber and it was a gift for Dot. It was to build a library. “Aunt May” said since she couldn’t keep the books, maybe this would give the valley a stationary building to house the donated books as well as those available from the regional Bookmobile. The delivery included one window and one door. It turned into a 6′ x 5′ building, which became the Back Valley Public Library, under the Clinch Powell Regional Library. One story about the building was that as completion was nearly reached, Perry Byrd discovered the lumber supply lacked one board. Mr. & Mrs. Leon Smith and children Leon, Glenda and Sharon paid for that last board. The Library opened August 1, 1956 with 75 books. The walls were covered with rough lumber shelves, contrived of cast-off bunk beds. Over the years the collection continued to grow, and Dot and her family continued to serve the community. Dot’s daughter Barbara’s first job was with the Anderson County Board of Education, where she worked for Superintendent, educator, and author John Rice Irwin. Almost immediately following this article, Dot received a call from the David Letterman Show, asking her to appear. She decided she did not want to appear, and Barbara jokingly told her mother to let the Letterman Show know she would just wait on Johnny Carson. Dot was absolutely beside herself when a call from the Carson Show came just a few weeks later! She and Louise (Walls/Scarbrough) Crowe were flown first-class and with VIP treatment, to Burbank where Dot appeared on Johnny’s show. Those who watched may remember that interview. She received a courtesy check for $200.00; and with that began the bank account to build a new library in Coalfield. With the tremendous support of many members of the Coalfield Community, the new library was completed and dedicated in 1994. It now encompasses 2600 sq. ft., with separate areas for children’s and adult collections, and a community room. The library houses a collection of about 10,000 books, as well as dvds and videotapes, books on tape and cds. It provides free computer access to everyone in the community, giving residents access to, virtually, the whole world. 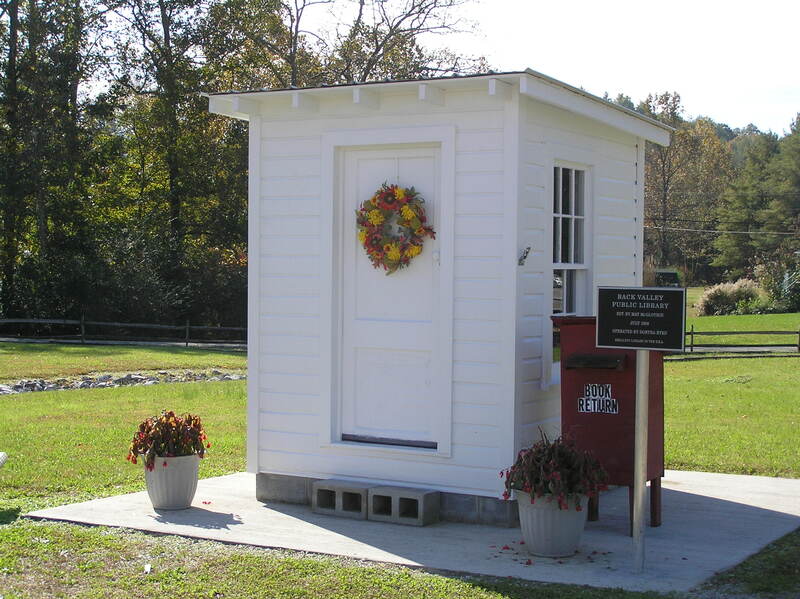 The “little library” as it has come to be called, celebrated its 50th anniversary in 2006, and in October of that year, the building was moved to the grounds of the new library, where it sits today. There is a commemorative sign outside, and the sign on the door tells us that “the door is never locked,” just as it has been for all of its history. I love the site! You did a great job! I remember the library. I used to walk to the library and check out books. Interesting content. You should use social websites to increase traffic and make your site go viral. Do you have a good picture of “Dot” Byrd? I am John Rice Irwin’s (Founder of the Museum of Appalachia) assistant and Mr. Irwin would like a photograph of Ms. Byrd if one is available. Thanks. Hi David. We do not have a picture of Dot Byrd here at the library. I am very disappointed in your new hours. They are not at all helpful for kids when they get out of school to do homework and not to mention the lack of Saturday hours now. Please go back to your old schedule! While we appreciate your input, we conducted a survey and looked at historical data before making the schedule change. The survey asked patrons about their preferred hours and we chose the option that was most popular. The historical data was from the library’s attendance for the past 6 months. Saturdays were the least attended business day without exception. We hesitated to not have any Saturdays at all, which led to our being open the 2nd Saturday of each month.